College is expensive, and funding your education can be hard work. The good news for New Mexico residents is that public and private organizations exist to help you pay for your education, and you don’t have to be the high school valedictorian or demonstrate extreme financial need to qualify for all of them, either. New Mexico residents can apply for financial aid at the federal, state, and local levels, and may be eligible for other scholarships and grants, as well. In order to find the types of financial aid that can best meet your needs, let’s walk through the four steps all New Mexico residents should take when funding a college education. The FAFSA, which stands for Free Application for Federal Student Aid, is every student’s first step to paying for a college education. The FAFSA is used nationwide to determine your eligibility for certain financial aid offerings, and the form itself has the potential to qualify you for scholarships and grants. Unfortunately, however, the FAFSA is known for being a long form to fill out. If you experience frustration during the process, check out our free guide to walk you through the process, and remind yourself that it will pay off (literally) in the end. Once you’ve submitted the FAFSA, you can apply for aid administered directly by your state, as well. New Mexico provides a range of scholarships and grants specifically for state residents that you may be eligible for. New Mexico Scholars for high-achieving New Mexico residents who are under to the age of 21. The scholarship covers tuition, books, and fees. Athletic Scholarship for New Mexico student athletes attending eligible New Mexico post-secondary institutions. Bridge Scholarship, also known as the 3% scholarship, provides first-semester tuition and fees for New Mexico residents who have graduated from an eligible New Mexico high school. Student Incentive Grant for students demonstrating financial need and attending a New Mexico college, university, or tribal college. The award provides recipients with funds between $200 and $2,500 per year, and can be applied to through the eligible institution the student plans to attend. College Affordability Grant for New Mexico residents who do not qualify for other state grants and scholarships, who are planning to attend a New Mexico public college or university. The New Mexico Higher Education Department offers additional scholarships and grants, loans, and work-study programs for New Mexico residents to use toward their college tuition. Not all college aid is administered by the state and federal government, so you can conduct searches for local and privately administered scholarships and grants as well. For assistance, current high school students can schedule appointments with the high school guidance office. Your guidance counselor can keep you in the know about current and upcoming scholarships near you, and assist you in the application process. Even a short appointment may be more helpful than you realize, so be sure to set a reminder in your phone to remind yourself to show up! Scholarship searching doesn’t have to take place exclusively in the classroom, either. Click around online after school, or on the weekends, on search engines such as CollegeScholarships.com. Use keywords that indicate your intended major, school, or personal strengths. If you’re in need of additional financial aid, you may want to look into taking out a private loan. 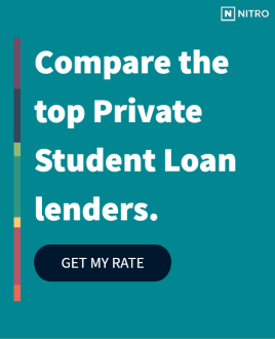 The right private loan may be able to connect you with the remaining funds you need to fund your college education. Before taking out just any New Mexico private loan, play around with our free NitroScore tool to get a better idea of the size of loan you need, and which of our highly vetted loan partners can offer you the best rate. The tool will ask you to enter a college and major into the boxes provided, and will use this information to calculate your total costs, your salary after graduation, and potential loans needed. From there, you will receive a score that tells you how easy those loans will be to repay based on your projected salary. Customize your results by entering info about scholarships, grants and savings, and comparing different college/major combinations to get a better idea about which options fit into your financial situation. The cost of college shouldn’t have to stand in the way of New Mexico residents and the education they need. Check out these resources, and start planning for your education today.